The last surviving territorial governor of Alaska has died in San Diego at the age of 94, according to multiple news reports. Mike Stepovich was appointed governor of Alaska by President Dwight Eisenhower in 1957 and served 16 months in office. He resigned to make a run for Senate that proved to be unsuccessful. 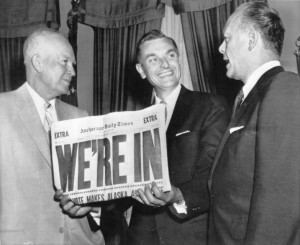 Governor Mike Stepovich of Alaska holding a copy of the Anchorage Daily Times announcing passage of the Alaskan statehood bill. Photo courtesy University of Alaska Fairbanks. The Anchorage Daily News said he championed Alaska statehood, though the success of the movement was generally credited to others. Alaska was admitted to the union as the 49th state in 1959. Family members told the Fairbanks Daily News-Miner that he suffered a head injury Saturday while visiting his son, Jim. Stepovich was born on March 12, 1919, the son of an immigrant from Montenegro who arrived during Alaska’s gold rush. He later served in the Navy and became a criminal defense lawyer in Fairbanks. He had 13 children with his wife, Matilda, who died in 2003.